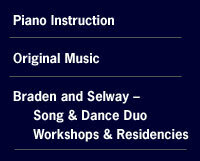 "The song and dance performances of the duo, Braden and Selway, are a pure delight. The moment the two appear, the audience is captivated. Braden and Selway enjoy their work, and their interaction with the audience. The music, songs and choreography are smooth, a lot of fun, and cohesive. Braden and Selway performed for my mother and some thirty of her colleagues at an Alzheimer's assisted living facility. The smiles, laughter, applause, and enthusiasm bursting forth from these wandering, sometimes lost minds, was a heart warming, joyful experience for all of us, including the many grandchildren who also attended." In the tradition of the great song and dance teams of stage and film, Dianne Braden and James Selway recreate songs and dances from Hollywood musicals and from Broadway musical classics. They delight in working with young people and in teaching them song and dance routines. They have many years of experience in preparing musical routines that can be learned within a relatively short period of time that can fit comfortably into a school’s daily morning schedule. I Whistle A Happy Tune, Getting To Know You, Shall We Dance? John Rutter’s “Wind In the Willows” based on the Kenneth Grahame classic. For bookings please contact Harnes Selway Arts at 703-734-0621 or by email at HarnesSelway@aol.com. Dianne Braden received a BFA degree in Dance from Texas Christian University and has done graduate work in dance at American University. She has performed with the Fort Worth Civic Ballet and with the Jan Taylor Dance Company in Washington, D.C. Ms Braden is a member of the faculty of the Arlington (VA) Center for Dance and a founding member of The Center Dance Company. Her choreography is frequently featured with the Center Dance Company, with the World Children’s Choir, and with Singers ONSTAGE!. She has been a faculty member of Summer Music Fest, Kingston, Ontario and has performed on Tap America! concerts in Washington, D.C.
James Selway, a graduate of The Juilliard School with a degree in voice and opera theater, has sung with the Aspen Music Festival, the New York Chamber Soloists, the Washington Opera Society, the Sokol Opera, and the American Opera Center. He has sung in Israel and throughout the Caribbean as soloist with “Around the World in Ninety Minutes,” an international touring show sponsored by International House in New York. He is stage director of Singers ONSTAGE! and also directs Gilbert and Sullivan operettas at Summer Music Festival, Kingston, Ontario. He is Associate Director of the World Children’s Choir, McLean, Virginia. Mr. Selway dances with Arlington, Virginia’s Center Dance Company as Ambassador Drosselmeyer in The Nutcracker.